Who else has started planning their Christmas Day menu? Although it’s only going to be the four of us this year (something I’m actually really excited about), I’m still planning to go all out and will be making sure we enjoy delicious food and all have full tummies at the end of the day. Whilst I’ve locked in most of our menu, I’m still unsure what to make for dessert. 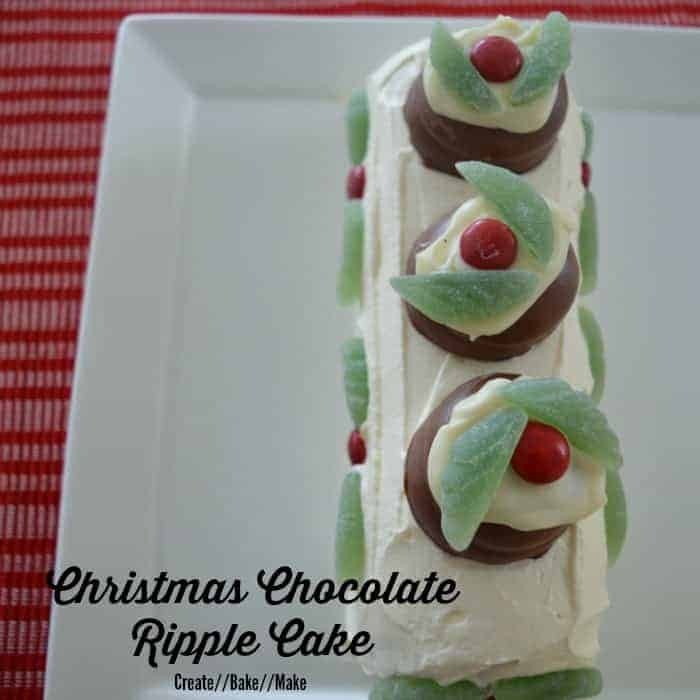 Traditionally we have always enjoyed my Nan’s Chocolate Steamed Pudding with hot custard, but given the hot Brisbane weather at this time of the year (this will be only our third Christmas in Brisbane after living here for almost 11 years), I’m thinking a light and cool dessert like this Christmas Chocolate Ripple Cake may be a better option. 3 x Chocolate Christmas Puddings – find the recipe here. Make a batch of the Chocolate Christmas puddings – recipe here and place in the fridge until needed. Cut the spearmint leave in half and set aside. 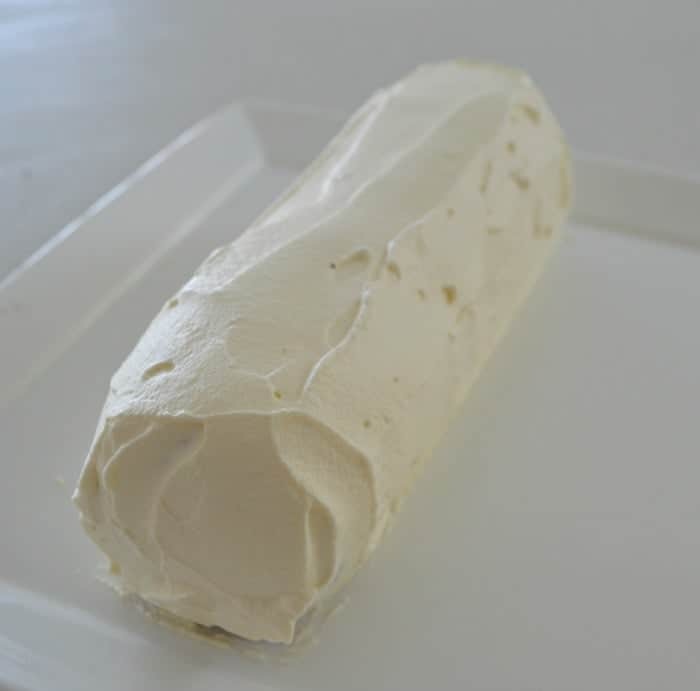 In a small bowl, combine the thickened cream, icing sugar and vanilla essence and beat until soft peaks form. Smear a little cream on the base of your serving plate and begin to place the biscuits on top. 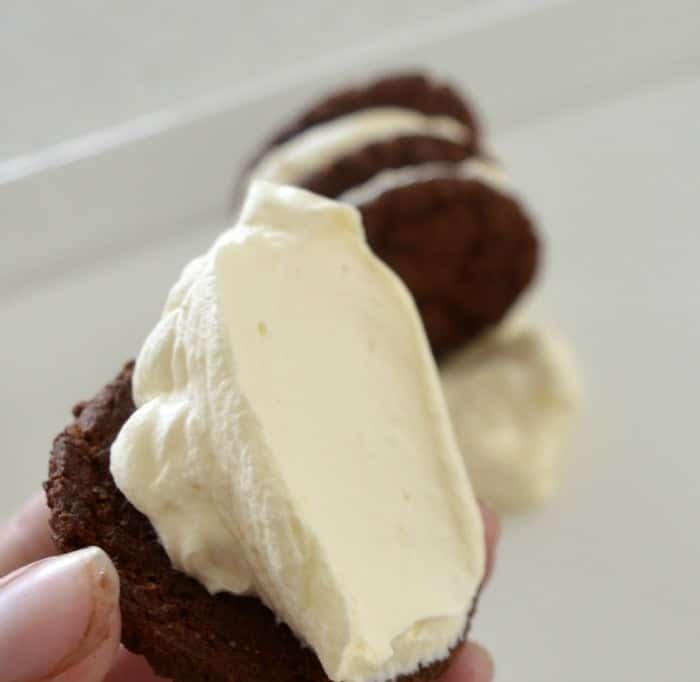 Add a dollop of cream in between each of the biscuits – I find the easiest way to do this is cover one side of the biscuit with cream before placing on the plate – as shown. Continue until your cake is the desired size or you have used approximately half of the cream. 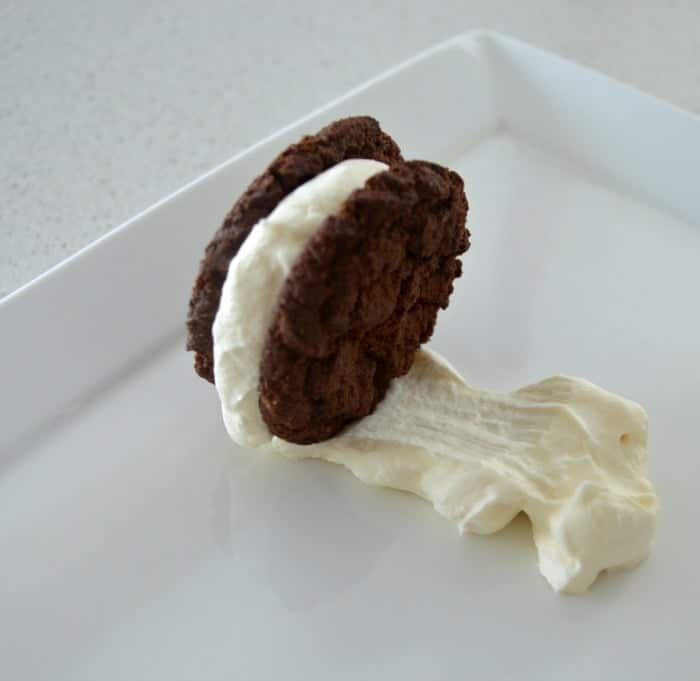 Carefully cover the biscuits with the remaining cream. Place three of the Chocolate Christmas Puddings on top of the cake. 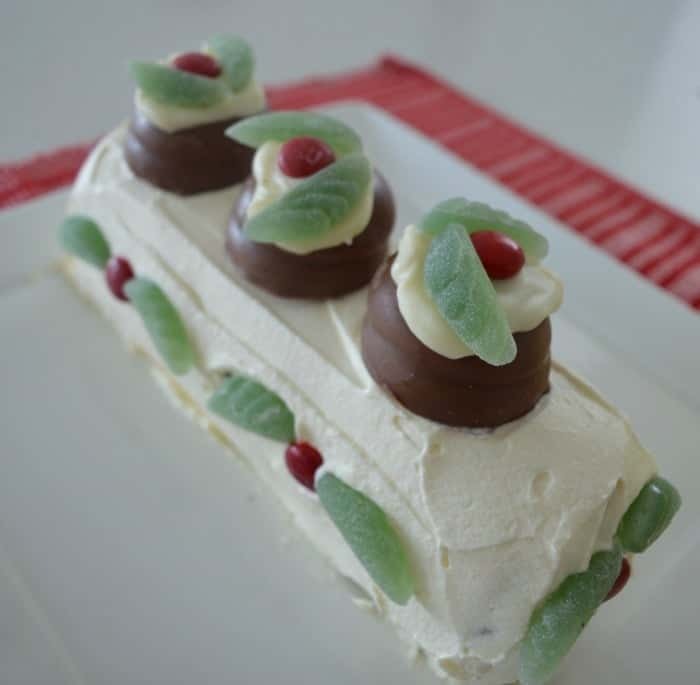 Create ‘holly leaves’ along the sides of the cake by placing two of the spearmint leave halves beside a red M&M. Once decorated, place the cake in the fridge for a minimum of 6 hours to allow the biscuits to soften. Remove cake from the fridge and enjoy! « Malteser Ice Cream and win your own ice cream maker! Reminds me of Christmas when I was little…we had a gingerbread biscuit version of that cake. Delish! I haven’t worked out the Christmas menu yet but I have done all my Christmas shopping – YAY! 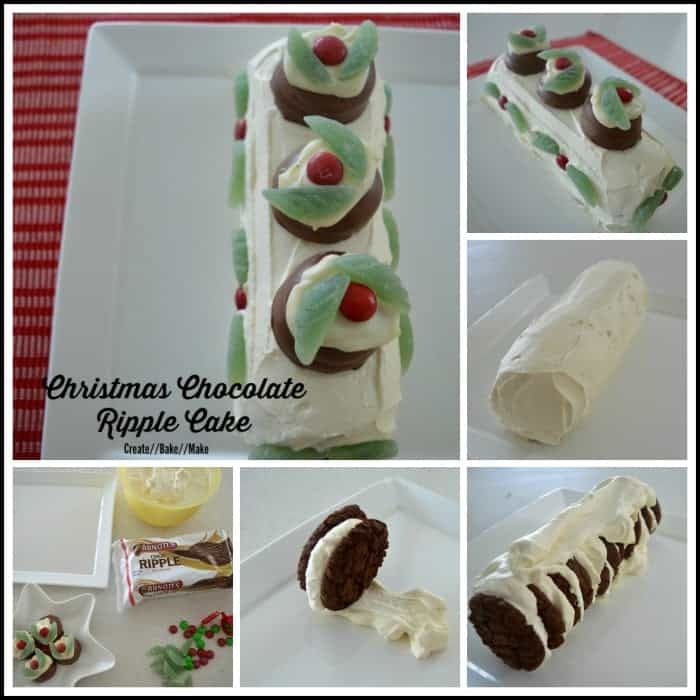 Love this gorgeous festive cake roll. I’ve made a choc ripple cake before and they are insanely delicious. I love the cute Christmas decorations on yours! This looks festive and fabulous! The perfect Christmas treat! Inspired! This looks so good Lauren! 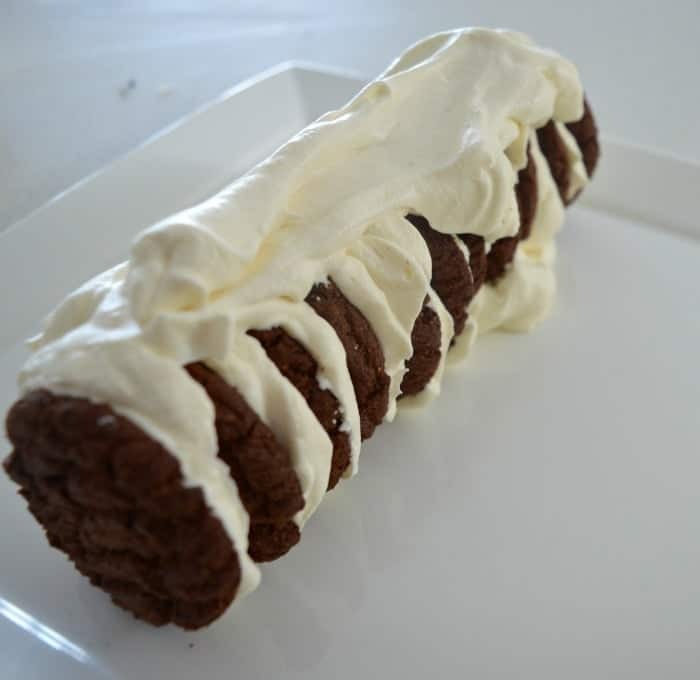 I’ve actually never made a Chocolate Ripple Cake, I should give this a go! Thanks for linking up with our Christmas link party!! One of my favourite “I’ll impress you!” recipes. Looks so good and is so super easy, even I can make it! Um, YUM! My aunty makes something very similar for Christmas but she soaks her choc ripples in something disgusting. I think Grand Marnier or Brandy or something toxic. It nearly blows your socks off!